When your turn begins, place 1 virus counter on Virus Breeding Ground. 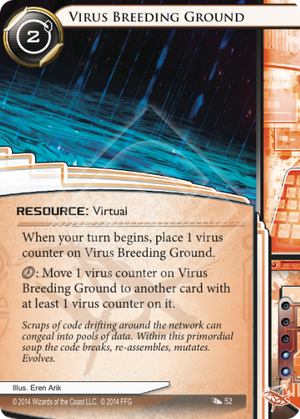 click: Move 1 virus counter on Virus Breeding Ground to another card with at least 1 virus counter on it. Scraps of code drifting around the network can congeal into pools of data. Within this primordial soup the code breaks, re-assemble, mutates. Evolves. I am not a tournament pro, but I will attempt to do a decent review on this anyway. First of all, this card can't win the game on it's own. In fact, it can't do anything on it's own that you would normally want to do in a game. It doesn't give you credits or get you past ice or anything like that. That's a strike against it. Secondly, this card costs a lot to actually use. One action to draw it, two actions worth of credits, and another action to lay it out is already a lot to pay for a card that doesn't help you directly get closer to winning by itself. Then you see that, in order for this to even be good in a janky combo, you have to spend a lot of clicks on it. In order for this to be worth very much, you have to play it and some number of other viruses to combo with it. You have to have both out at the same time or just the other card and not this. There are indeed plenty of decent cards that this could work with for anyone who has it in mind to make a janky combo deck, but said deck probably still won't win. If you insist on trying this card out, you might want to try pairing it with such cards as Orion, Darwin, Hivemind, Datasucker, Parasite, Fester, Grimoire, Imp, Medium, Nerve Agent, Pheromones, Progenitor, and Noise: Hacker Extraordinaire. Better yet, just don't use this. Incubator is probably better for everything you would want to do with those cards anyway. Or just use those other good cards and don't use either this or Incubator.